Founder David Morgan holds a print at Green Lion Gallery. 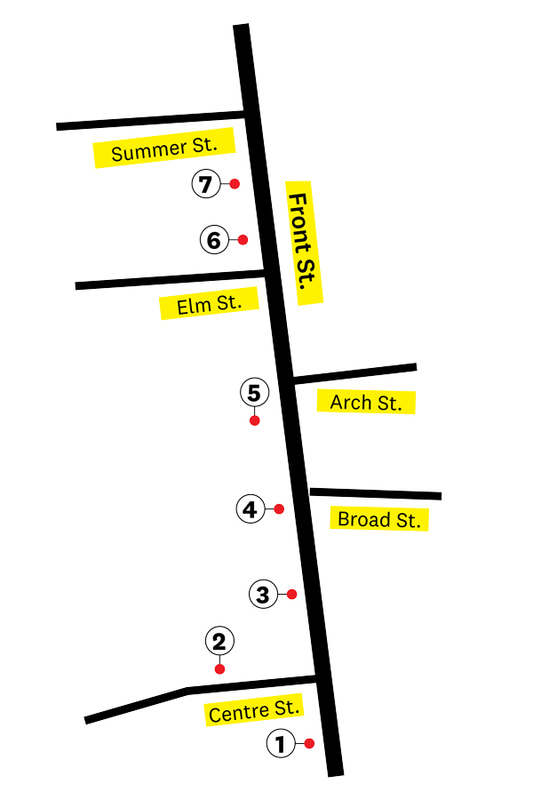 Bath’s downtown shopping district is as attractive and full of surprises as it is easy to access. Packed with locally owned stores, this snug shipbuilding city along the Kennebec River includes popular draws like Now You’re Cooking, which fills an entire city block, and Halcyon Yarn, with fibers from around the world, a brand-new brewery, rave-worthy restaurants, and a beloved coffee shop, all near the picturesque waterfront park. This high-end gallery represents 60 artists — most from within 50 miles of town — working in glass, stone, silver and gold jewelry, hand-painted pottery, wooden bowls, and a variety of fiber arts. Be sure to check out Bath sculptor Wayne Robbins’s wood-carved birds and sea animals. 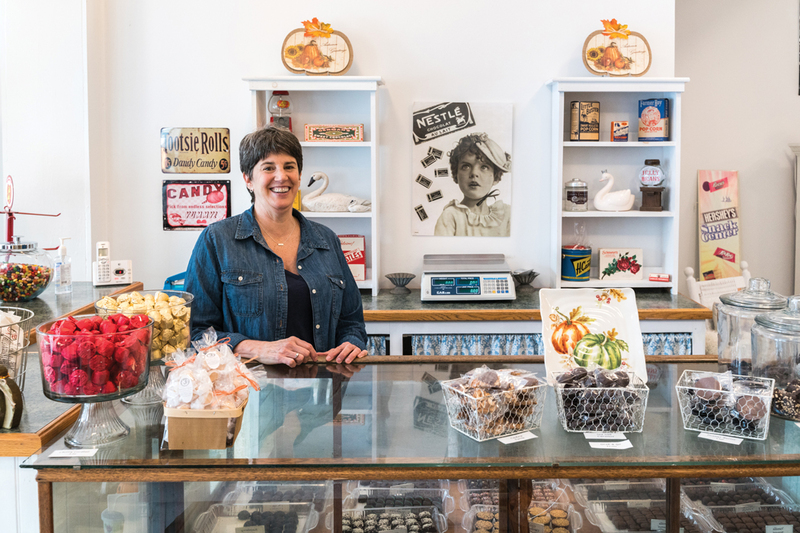 Nostalgic treats and Haven’s chocolates — made in Maine for more than a century! — are on full display at this classy candy shop. Keep children happy with a $1 grab bag. 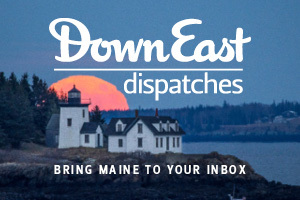 Founded 88 years ago just up the coast in Boothbay Harbor, this stylish clothing and gift store expanded to Bath seven years ago and is still run by the same family. Need a hostess gift? 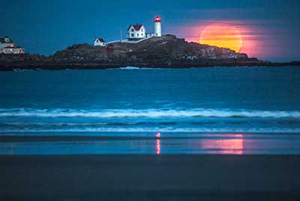 Look for totes, mugs, towels, and cozy blankets by Mapisart printed with charts of the Maine coast. Bibliophiles Julie Shea and Susan Shipsey combined their love of books, vintage china, and tea to serve customers at Bath’s only firsthand bookstore. 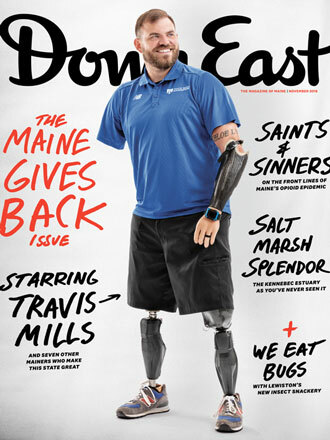 Browse new releases, plus a wall of books by Maine authors. Or select a teacup and enjoy a freshly brewed pot from the Octavia Tea Company with the store’s signature shortbread cookies. The counter at Bath Sweet Shoppe. Daydream #8 by Rebecca Goodale at Green Lion Gallery. 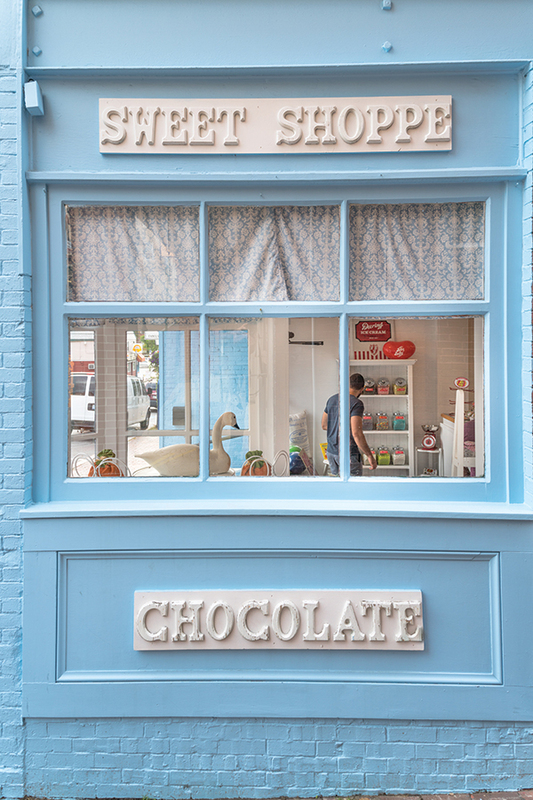 Looking in the window at Bath Sweet Shoppe. 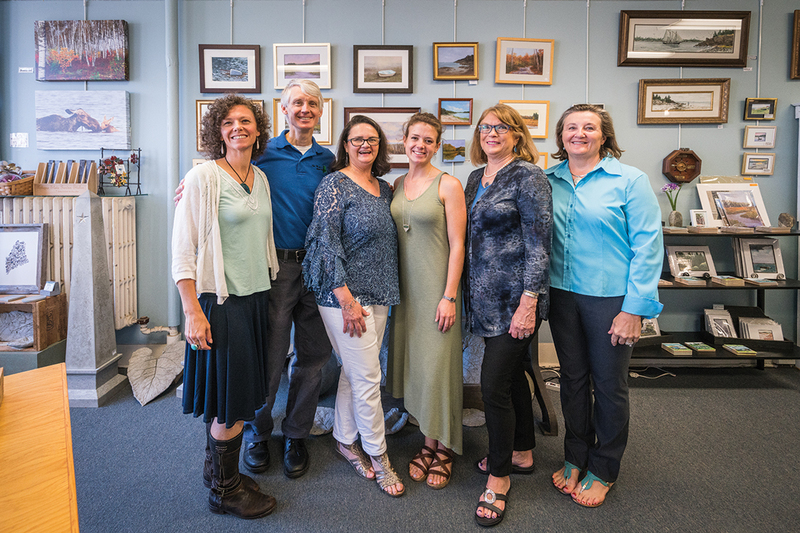 Lisa-Marie Stewart along with her family and staff at Lisa-Marie’s Made in Maine. 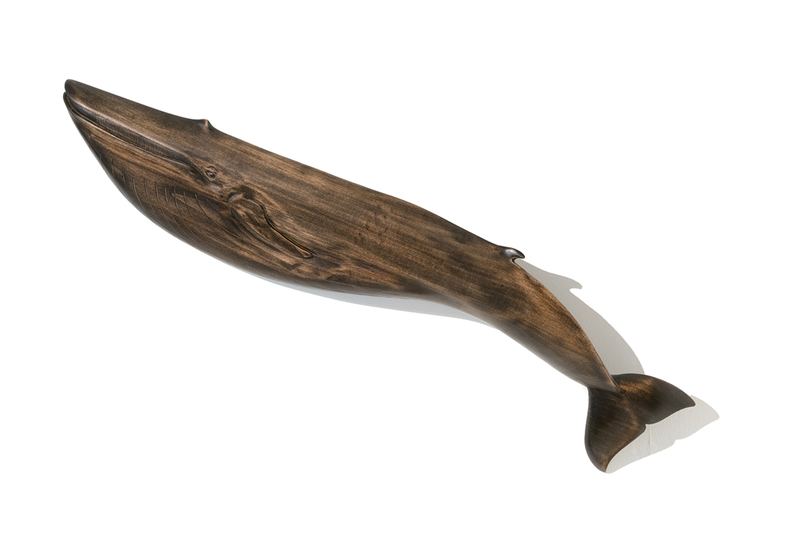 Whale sculpture by Wayne Robbins at Markings Gallery. 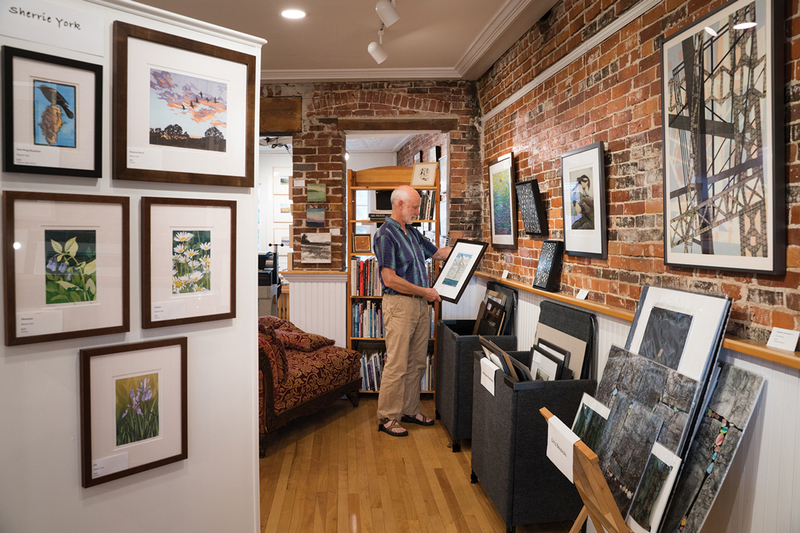 Owner and printmaker David Morgan operates an etching press in the back of this vibrant gallery featuring nearly two dozen printmakers from Maine and around the world. 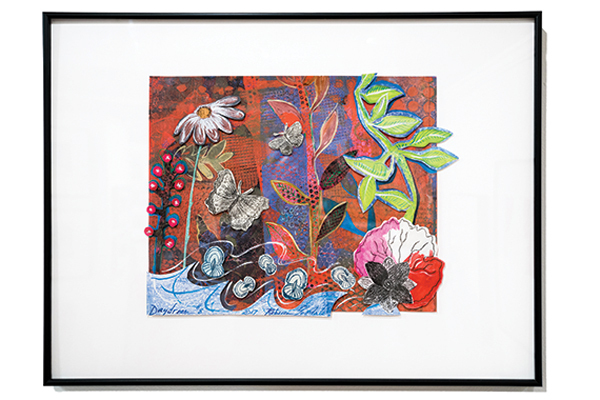 Each original print ($60 and up, unframed) — from birds and landscapes to still lifes — is individually made. Step through the door and you’ll discover why, when asked where to find locally made goods, one neighboring storekeeper answered, “Other than Lisa-Marie’s?” The shop’s four rooms are packed with modestly priced Maine photography, jewelry, pottery, handbags, children’s items, and treats. 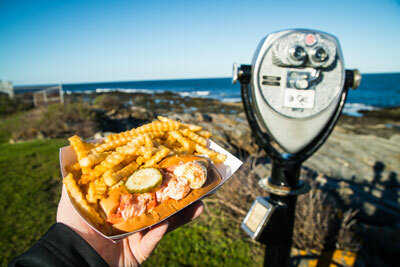 Hand-decorated pet collars, locally grown catnip, and dog treats made with Maine lobster (caught off Friendship) are a few reasons for this recently expanded pet store’s loyal following. Pets welcome.